Volkswagen’s latest generation of engines – announced at the Tokyo Motor Show and set to go into full production in 2013 – will be driven by a single stage, low friction, toothed drive belt using NGF Europe's HTS Glass Cord, which will last the life of the engine. This is a significant move by Volkswagen as it represents the conversion of a mass market chain engine to a belt and, in the company’s own words, marks ‘the renaissance of toothed belts’. The new generation of engines known as the Modular Transverse Matrix (MQB – Modularen Querbaukasten) represent a turning point in the design and production of future Volkswagen vehicles . The potential global market for this engine is estimated to be three million units. The transverse-mounted engines have vehicle components which are standard across brands and vehicle classes. 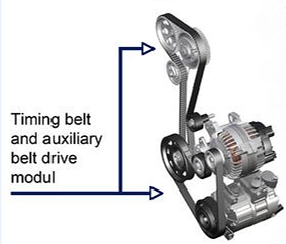 The diesel version of the engine is driven by a belt manufactured with a new generation glass cord developed by NGF Europe and will feature another Belt In Oil application as the drive for the oil and vacuum pumps operates in the oil sump. The new engines are also more fuel efficient than their predecessors and the toothed drive belt in oil is much quieter than chain driven alternatives.